The Austin Film Festival opens Oct. 13 with Austin-based director Jeff Nichols’ fact-based interracial drama Loving and closes Oct. 20 with the Miles Teller boxing drama Bleed for This. Other high-profile films include Gael García Bernal’s Desierto, Ryan Gosling and Emma Stone’s La La Land, Dev Patal’s Lion, Michael Fassbender’s Trespass Against Us, and Frank Langella’s Youth in Oregon. Director Kelly Fremon Craig and producer James L. Brooks will attend the screening of The Edge of Seventeen, this year’s Austin Film Festival Centerpiece Film. Austin will be represented in the festival, among others, The Big Spoon, Canine Soldiers, Found Footage 3D, Funniest, The Golden Rut, ProGamer, and the Rooster Teeth web series Crunch Time. There also will retrospective screenings of Happy Gilmore, The Last Supper, A Little Princess, The Muppets!, The Producers and What’s Up, Doc? The Austin Film Festival will honor Bridesmaids and Ghostbusters director Paul Feig, Private Benjamin and It’s Complicated screenwriter Nancy Meyers, and Friends showrunner Marta Kauffman. The Austin Film Festival Conference, which runs Oct. 13-16, includes conversations with Bobby Farrelly, Jason Segel, Shane Black, The People vs. O.J. Simpson writer Scott Alexander, Adam Sandler screenwriting partner Tim Herlihy, and (500) Days of Summer screenwriters Scott Neustadter and Michael H. Weber as well as panels dedicated to Creed, I Love You, Man, The Motorcycle Diaries, The Revenant, and Saturday Night Live! 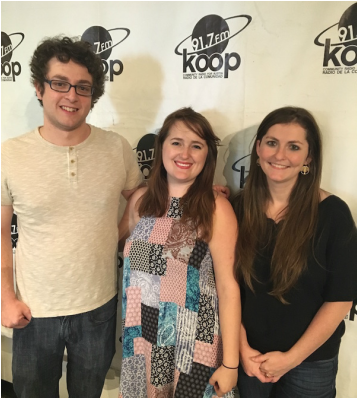 The festival's senior film programmer Liz Mims (center) and film competition director Harrison Glaser (left) join creative director Erin Hallagan (right) during this interview.